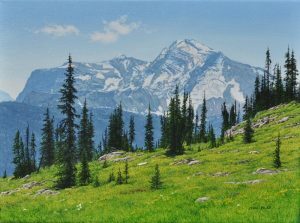 Opening December 1, 2018, Gainsborough Galleries, Calgary, hosted their annual group Christmas Show, including new work from Jean Pilch. 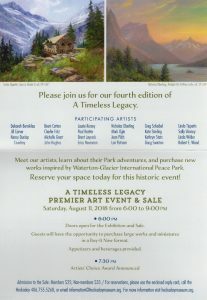 “The Hockaday Museum of Art is pleased to announce an international edition of our annual ‘A Timeless legacy’ exhibition, ‘A Timeless Legacy: Peace Park 2018’. 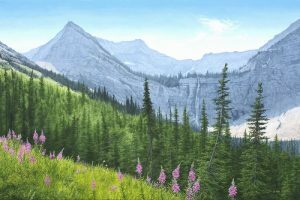 Opening in August 2018, this exhibit will feature the works of critically acclaimed artists from the United States and Canada who have created pieces inspired by Waterton-Glacier International Peace Park. 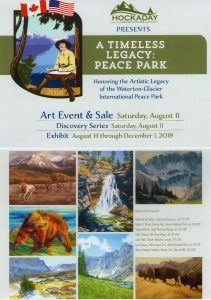 For more information, please visit http://hockadaymuseum.org/ Click on “Exhibitions”, then “A Timeless Legacy: Peace Park 2018”.